New forces reshape the scenarios of world development. Frequently vilified Capitalism seems to be evolving to more advanced forms of solidarity. Most Latin American politicians rage against “wild capitalist systems”. Left oriented politicians claim socialist systems are superior in social issues: equality, environment, inclusion. But as those politicians propose free health and education schemes, their terms end up with default economies, maybe because the other side of the equation (production) is seldom or vaguely defined. Socialism was born with high expectations and its baselines have been quite high, but results have not measured up to its dream. Socialist prone governances have devastated plenty economic sites, quickly becoming authoritarian control systems. “Marxism was never able to construct alternative realities. It will never be a viable trend of power because it does not comprehend economy. By definition Marxism is anti-economic, it does not understand the natural identity of money, its advantages and tragic disavantages depending on our expertise to convert it in instrument to organize society.” Says Alonso Moleiro in an article “The Identity of Money” in the venezuelan Journal Tal Cual. After more than a century of theoretical disputes, some answers come to the economic world lifting up hopes for the future. It seems Capitalism is building-up positive features to outgrow its traditionally greedy appearance. New dreams to change the world by “applying the skills of moneymaking to the philanthropic enterprise” are being transformed into efficient organizations by bright entrepreneur leaders. Associations between corporate giants, nonprofits, philanthropists and governments are proliferating as emblematic icon companies, design strategies to deepen their social commitment. In the book “Philanthrocapitalism”— its authors Mattew Bishop & Michael Green review a new approach to giving, which they define as applying the skills of moneymaking to the philanthropic enterprise. They note its cons, too. 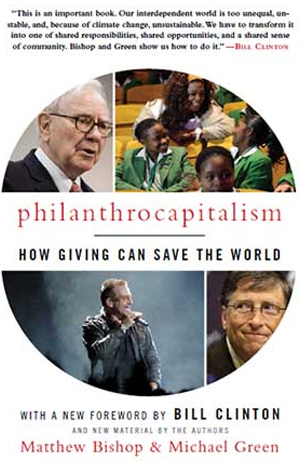 The leading new philanthropists see themselves as social investors. Much of philanthropy has been inefficient, even failed, but last 2 decades have been a golden era for capitalism and new philantropists. They try to apply their secrets of success in money making, to their donations to motor the changes the world needs . The need for philanthropy to become more like the for-profit capital markets is a common theme among the new philanthropists, especially those who have made their fortune in finance. As they see it, three things are needed for such a philanthropic marketplace to work. First, there must be something for philanthropists to “invest” in something that, ideally, will be created by “social entrepreneurs”, just as in the for-profit world entrepreneurs create companies that end up traded on the stock market. Second, the market requires an infrastructure, the philanthropic equivalent of stock markets, investment banks, research houses, management consultants and so on. Third, philanthropists themselves need to behave more like investors. That means allocating their money to make the greatest possible difference to society’s problems: in other words, to maximize their “social return”. Some might operate as relatively hands-off, diversified “social investors” and some as hands-on, engaged “venture philanthropists”, the counterparts of mainstream venture capitalists. All this may sound fine in theory. However, the history of philanthropy suggests that there are many potential pitfalls. The Rockefeller Foundation, for example, found a cure for yellow fever and drove the “green revolution” in agriculture. Carnegie, among other things, built thousands of public libraries. Yet this long-term investment ethos has proved to be the exception, not the rule. In a landmark article, “Philanthropy’s New Agenda: Creating Value”, Michael Porter and Mark Kramer described widespread flaws in America’s foundations that mostly remain to this day. For instance, little effort is devoted to measuring results, and foundations have unjustifiably high administration costs. The new generation of philanthropists are trying something different from the t raditional foundation? Ebay’s Mr Omidyar thinks so. He has folded his Omidyar Foundation into Omidyar Network, which is free to make for-profit investments as well as philanthropic donations to pursue its mission of “individual self-empowerment”. “After a few years trying to be a traditional philanthropist, I asked myself, if you are doing good, trying to make the world a better place, why limit yourself to non-profit?” he explains. Although there is a separate chequebook for the foundation, his “investment team” is free to put his money in either for-profit or non-profit projects. The team’s main criterion is whether the investment will further the social mission. The new philanthropists also need to be clear what they want to do, and stick with it. That is one lesson from the Gates Foundation, which has already notched up some remarkable achievements—helped by its huge size, which allows it to do things that are beyond everyone else. Its clear mission is to tackle global health inequalities in six main areas: infectious disease, HIV/AIDS, tuberculosis, reproductive health, global health strategies and global health technologies. Crucially, it has found ways of using its money to the greatest effect. Mr Gates’s big idea is to overcome the market failure afflicting poor consumers of health care by deploying his money on behalf of the poor to generate the supply of drugs and treatments they need. For instance, the money provides market incentives for drug companies to put some of their resources to work for the needy. New York is often described as the World’s Capital City, as the headquarters of capitalism. Last week of September each year, hundreds of world leaders invade Manhattan. You could believe that this is the global capital – but what is now bringing them to town, is not capitalism but rather philanthrocapitalism. Ten years ago, the annual event was a closed affair in which Heads of state delivered long, impotent speeches at the United Nations General Assembly. Since 2005, the annual meeting of the Clinton Global Initiative has become a magnet for businesses and non-profits, a philanthrocapitalistic marketplace with an emphasis on explicit commitments of action to tackle global problems. Lets hope we are beginning to implement the miracles our world needs.